I don’t know about smoking a pipe but we did have Popeye cigarettes when we were little. We definitely made lots of mud pies. 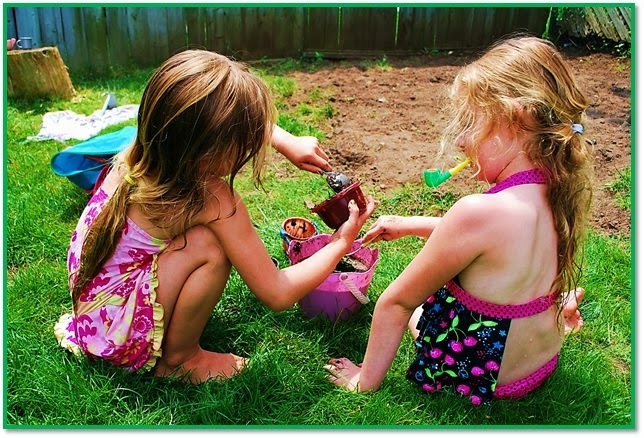 I remember spending many hours in the summer out back with my sister making mud pies and digging to China. My daughters didn’t make many mud pies because we lived in an apartment for most of their childhood. Mind you they did get a chance to experiment with it a bit at their cousin’s house. Baby Cakes and Honey Bunny making mud soup with a hint of grass. Now my granddaughters thoroughly enjoy a good mud pie, mud soup, mud cake, a mud anything. There’s always someplace in the yard that is good for digging up. I like a nice lawn but I have my priorities – such as a good old fashioned mudfest. My girls can spend hours creating all sorts of concoctions which of course they bring to me. Grandma is always ready to gobble up the chefs' specialty. Mmmm. Yum. Yum. If your interested, stop by my Etsy Shop, Little Shop of Treasures or check out my Free Printables page.